Joy is a 1 D.o.F. 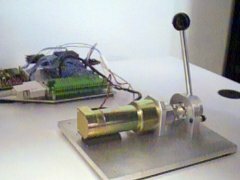 haptic master device, provided with a shaft mounted torque sensor, coupled with a PC-simulated virtual environment. This system was used to test a new control method for scaled teleoperation where slave workspace is much larger than master workspace.